The U.K.'s unemployment rate has fallen to within a whisker of the Bank of England's (BoE) targeted level at which it previously said it would consider raising interest rates. Unemployment in the U.K. fell to 7.1 percent in the three months to November, according to the Office of National Statistics on Wednesday. The BoE's unemployment target is 7 percent. 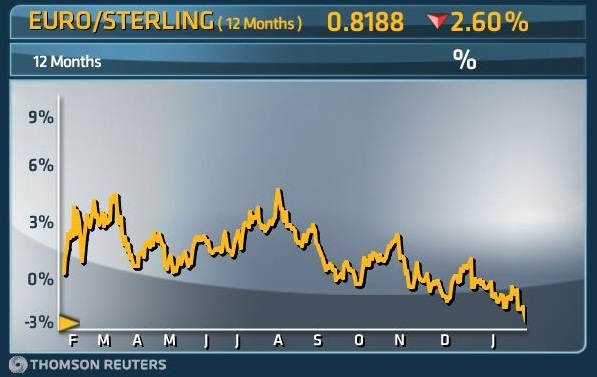 The latest figure is the lowest level since the January-March period of 2009 and is the latest in a long line of positive data from the U.K. Sterling jumped against the dollar and hit its highest level in a year versus the euro following the news. Minutes of the meeting of the Bank of England's Monetary Policy Committee (MPC), also released on Wednesday, showed that the MPC saw no immediate need to raise interest rates even if the 7 percent unemployment threshold were to be reached in the near future. "Despite the sharp drop in unemployment, we believe the odds are still strongly in favour interest rates staying at 0.50 percent all through 2014. While interest rates will probably start rising in 2015, this may still not happen until towards the middle of the year," Howard Archer, Chief European and U.K. Economist at IHS Global Insights said in a note.